DC Thomson are the masterminds behind some of Britans most loved comic book characters. The likes of Beano, The Peoples Friend and The Scots Magazine are a few examples of the range of library available at DC Thompson Shop. Their collection spans over all ages groups, from children to adults, with magazines, newspapers and comic books being the main part of what they sell. What type of products do DC Thomson Shop sell? With the growth of the internet, print/paper based media like magazines/comic books have been on a downward trend. 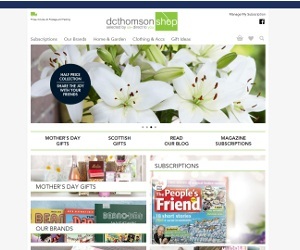 However DC Thomson offer a very attractive subscription model that all you to receive regular magazines without the hassle of going to the shops, they send direct to you. Which popular brands do DC Thomson Shop sell?